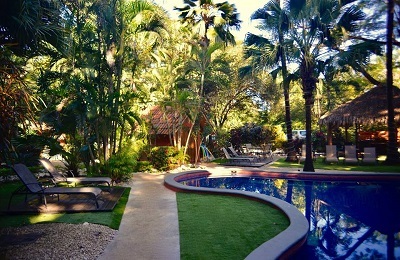 PLAYA GRANDE Surf Camp - Guanacaste, Tamarindo Guests overall rating: ★★★★★ 5 based on 3 reviews. The Surf Camp is proudly managed by three costarican brothers and sister, that will make sure you have an enjoyable experience during your vacations. The hotel is suited with all you need to experience the beach life, enjoy nature and the beauty of life. Since 2004 on the hosting business, our team has grown and has a very well understanding of travelers needs and expectations. We’ll be delighted to share and show you all the beauty of our coast, enjoy surfing, our country and make sure that our favorite phrase is accomplished! Just north of the famous seaside resort of Tamarindo, at the heart of Marino Las Baulas National Park, the stunning beach of Playa Grande with its pristine shoreline and clear blue sea, is one of the best beaches on the Guanacaste coast. Playa Grande is also reputed for the excellent surf found on the main beach, a protected area for nestling sea turtles as well as a playground for surfers from around the world. 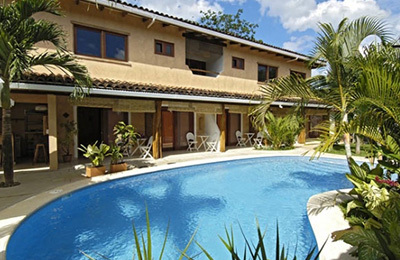 Playa Grande Surfcamp lies 100 metres from a large, white sandy beach. A sanctuary for both turtles and surfers, this beach has some of the best beach breaks in the country. Accommodation is in cabanas and the surfcamp also has a self catering kitchen and barbecue for guests to share, as well as a swimming pool. The dorm faces the beautiful nature of the principal garden. Daily surf instruction on the beach break in front of the surf camp. Playa Grande/Tamarindo has some of the best beach breaks in the country, making it an ideal destination for beginners. The surf around Playa Grande-Tamarindo does not seem to take a rest, with waves on a daily basis. This area of Costa Rica, thanks to its westward projection, stays very consistent with an abundance of waves. With such a large swell window, the area receives a ton of surf at the height of the season from April to November from low pressure systems in the South Pacific. Starting in December northwest swells will begin to make their appearance, continuing through March, thus keeping the coastline very much alive all year long. There is an assortment of breaks in the area, from fun beach breaks to some decent reef breaks, and many within walking distance of the accommodations. Some of the better known spots are Playa Grande, Playa Negra, Witches Rock and Ollie’s Point. At the heart of Las Baulas de Guanacaste Nature Preserve, the surfcamp’s five cabanas lies a mere 75 metres from a large, white sandy beach with a dream beach break. Supermarket and restaurants within a 2 min. walk from the surfcamp. Playa Grande is a small community with only a handful of hotels and its main attraction is the National Park Marino Las Baulas, famous for being a turtle nestling and hatching sanctuary. Another asset of Playa Grande is the excellent surf found here on the main beach. Playa Grande is much quieter than say its more famous neighbour Tamarindo, but the surf here is equally good. In fact, the breaks and swells are consistent enough to be rated amongst the best surf spots in the country. Playa Grande is separated from Tamarindo by the inlet of Tamarindo Wildlife Refuge, that can be crossed by boat shuttle. A former fishing village, Tamarindo is turning into Guanacaste region first seaside resort. Although only two kilometres apart, there is no direct road between Playa Grande and Tamarindo and the drive is about 45 minutes. Neverthelss, you can walk down the beach to the estuary and take a boat to cross the river, which will take about half the time of driving round the estuary. Costa Rica’s proximity to the equator means that it is generally hot and humid, with tropical conditions throughout the year. And while Playa Grande will be influenced by a dry season from November to April, the wet season from May to October is quite mild as Guanacaste is considered the driest region in the country. Tamarindo Airport (TNO) Nature Air: wwww.natureair.com (daily flight from San Jose) We can arrange pick ups. Liberia Airport (LIR), 60 min. Daily Flights from San Jose (AA, Delta, Continental direct flights to US) We can arrange Pick ups. $95 per night on high season. New year and holy week. Additional beds can be an option with an extra charge of $20 per person (Max 2 person). $195 per night on high season. Additional beds can be an option with an extra charge of $20 per person. $50 per night on low season. $85 per night on high season. Additional beds can be an option with an extra charge of $15 per person. 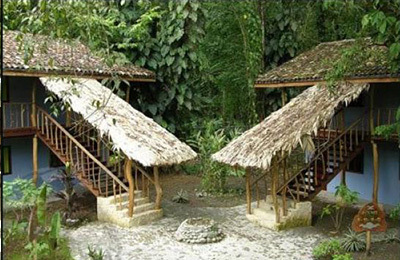 $15 per person per night on low season. 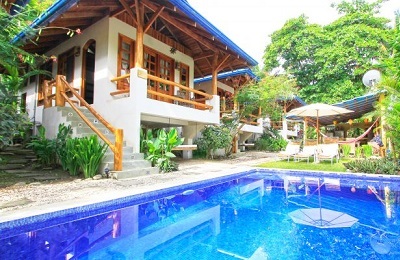 $25 per person per night on high season. New year and holy week. SJ Airport Priviate shuttle $220 4-5 hour drive, shared $56 from 6-8 hours depending on stops. Also we arrange shuttles from any place in Costa Rica, Nosara, Samara, Manuel Antonio, La fortuna, Santa Teresa, Montezuma, Jaco, Monteverde this will work by quote. Fantastic Location, Staff, Accomodations, Atmosphere! "Muchas Gracias for a wonderful stay BOTH times I was here. Vacationed here for a week with some friends and then again for a few days with family. The location for both occasions was perfect. A mix of tranquility and quiet, but a close ferry ride to a town with more action. I have actually stayed in all three type of rooms offered and they were well decorated and comfortable. Ariel greeted us at the desk and the rest of the staff was helpful with anything we needed spots to surf, calling cabs, booking us a tour, even playing some reggae music by the pool for my mom. The best part there are hammocks everywhere:) If your lucky you will spot some big Howler monkeys in the trees. Bonus! there's a delicious restaurant at the hotel next door that is worth checking out for breakfast and dinner. " "A bit off the beaten path, surfers will love the free board rental and quick walk to beach. Surf break deserted the best. 20 minute walk and 1$ boat ride to town for restaurants & bars. Best of both worlds. "luxury" rooms have AC. Splurge, it's hot. " "Such a wonderful spot, awesome friendly helpful staff, Super affordable, clean spacious rooms, extremely safe. Its a 1 minute walk down a cool path to an amazing beach, and walking distance from Playa carbón which was amazing to see (black sand beach ) and a quick walk down the beach to tamarindo. You can hear howler monkeys in the mornings!! super peaceful but there's so much to do in the area as well. I loved the outdoor kitchen too. We will definitely be coming back here the next time we come to CR!! I miss it already!!"